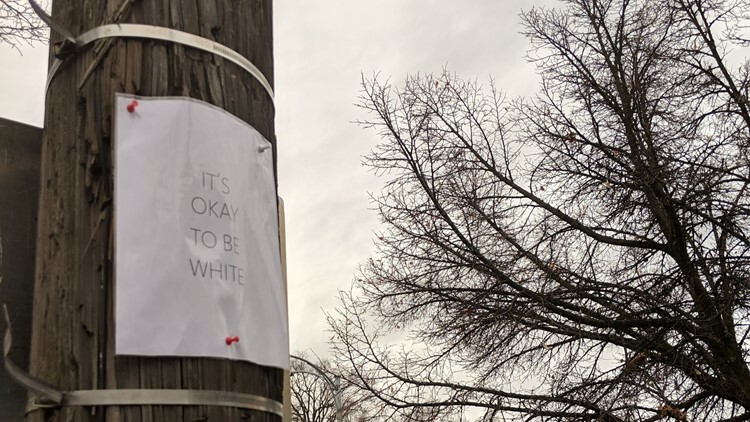 More than 30 fliers with the message "It's okay to be white," were found on the University of Idaho's campus on Thursday. The U of I president said the slogan is "associated with a provocation by white supremacists and neo-Nazi groups." More than 30 fliers with the message “It’s okay to be white,” were found on the University of Idaho’s campus on Thursday. In a statement, University of Idaho President Chuck Staben said the fliers placed on the public bulletin boards will remain there “as this is free expression of the poster’s belief, just as are other postings on those boards.” Posters placed on doors, walls or similar locations were removed in line with university policy. Jodi Walker, director of communications at the University of Idaho, said the school does not know who is responsible for posting the fliers or how many people were involved. This is the first time the fliers appeared on the University of Idaho’s campus. The Moscow-Pullman Daily news first reported the fliers on campus. Fliers with the same message were found on Washington State University’s campus in November 2017. Vice President of University Communications Phil Weiler said facility staff immediately tried to remove the signs from the Glenn Terrell Friendship Mall. Weiler said signs like this showed up on campuses throughout the U.S., that it is unclear who is putting them up or what their exact message is. But Weiler said one could reasonably believe the intention of the signs is to set a sense of fear and intimidation on campus. Weiler said this was not the first time the fliers made an appearance on WSU’s campus.